There is a contagious and combustible energy every time the eight-piece wonder-band The Suffers steps on the scene. NPR's Bob Boilen attributes the band's allure to their "Soul, straight from horn to heart." He adds, "This band is on fire when it's in front of an audience...but the intensity of their shows are also captured in the studio." Following The Suffers' electrifying late night TV debut on Letterman in 2015, David Letterman exclaimed, "If you can't do this, get out of the business!" There is something undeniable about The Suffers (whose name is a reference to the 1978 Jamaican film Rockers starring Leroy "Horsemouth" Wallace, Jacob Miller and Burning Spear, among others), that instantly hits home with their audiences. "We make music for all people," says lead vocalist Kam Franklin. "At this point, we've played all over the world and one thing is certain - if the music is good, the people will enjoy it." Since 2011, the H-Town heroes have been on a steady grind and have no plans of stopping. It seems the secret to their success is simple. Keyboardist Patrick Kelly confides, "There is a universal groove in the music that we play," while bass guitarist Adam Castaneda adds, "I don't think any of us are trying to impress anyone with our technical abilities, we just want to make them dance." Shanachie Entertainment will release The Suffers' highly anticipated label debut Everything Here on July 13, 2018. Guitarist Kevin Bernier says, "Everything Here, as a whole, explores the many aspects of who we are as people through songs. We've had crushes on people, we've had our hearts broken, and we've moved through all the difficult times so that we can experience the joyful moments." The Suffers have got everything you need and there's no need to look further - a heaping dose of soul, a dash of reggae, a splash of jazz, a pinch of salsa, a hint of rock 'n' roll and a dollop of hip hop and funk - and that is just a few ingredients simmering inside their magical Gulf Coast soul. Percussionist Jose Luna says, "The glue that holds us together is our experience. We have all played with so many bands and musicians through the years that we have learned how not to step on each others toes." Everything Here, a riveting collection of 15 originals that gives props to Houston (there are even cameos from Houston rappers Paul Wall and Bun B), explores the many sides of love, celebrates the virtues of individuality, reminds us of the destruction of Harvey and resilience of the human spirit and declares love for their mothers. All of these themes coalesce into one soulful soundtrack. The band co-produced the album with John Allen Stephens and Zeke Listenbee co-produced on several tracks. Trombonist Michael Razo explains, "One of our goals was to have the songs on the album flow or tie into each other. Like creating an album where you just press play and let it go without having to skip to the next song." "The Suffers are a contemporary version of the great R&B/funk bands of 70s and 80s...Rufus, Earth, Wind & Fire, Kool & The Gang, with a powerful lead vocalist in Kam Franklin and spot-on musicianship that is all too rare these days," says Shanachie Entertainment General Manager, Randall Grass. "They've done a great job of building a base on their own and we at Shanachie are looking forward to taking them to the next level." The Suffers’ drive coupled with their can't lose attitude and serious chops have taken them from their beloved Houston to the world stage (they are the first band to break nationally out of Houston in a long time). Lead singer Kam Franklin has the distinction of being a spokesperson for Houston as she has been tapped by the city to appear in a national tourism advertisement. “It means a lot to me that the city would trust me in such a grand way to represent them,” shares the dynamic singer/songwriter. 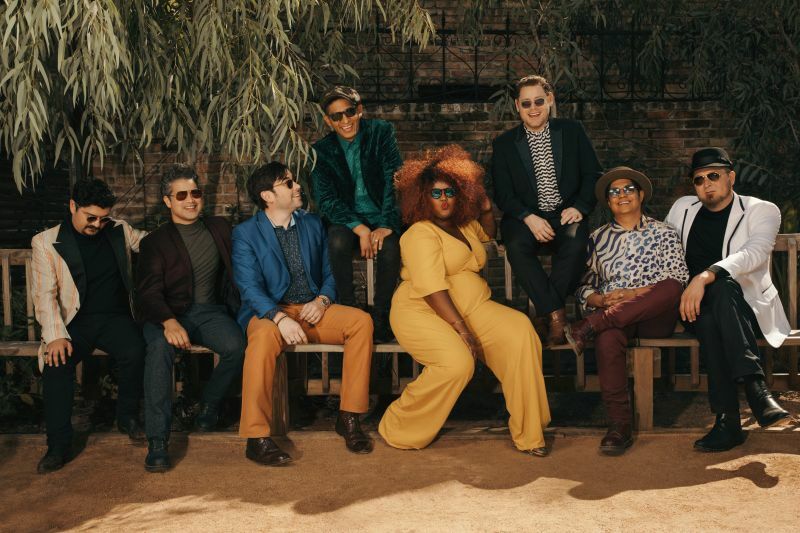 “Houston has played a huge part in making me who I am and introducing our music to the masses, and for that, we are forever grateful.” The Suffers have played sold out shows in Japan and Latin America, turned out audiences at the Newport Folk Festival and Afropunk Festival and made believers of just about anyone who has experienced their live shows. "We're a testament to teamwork and camaraderie resulting in things working out even when the odds are against a positive outcome," says drummer Nick Zamora. "The wonderful thing about music is that it is ultimate universal communication," reflects trumpeter Jon Durbin.